Idaho’s many rivers provide a tremendous source of renewable electric power. 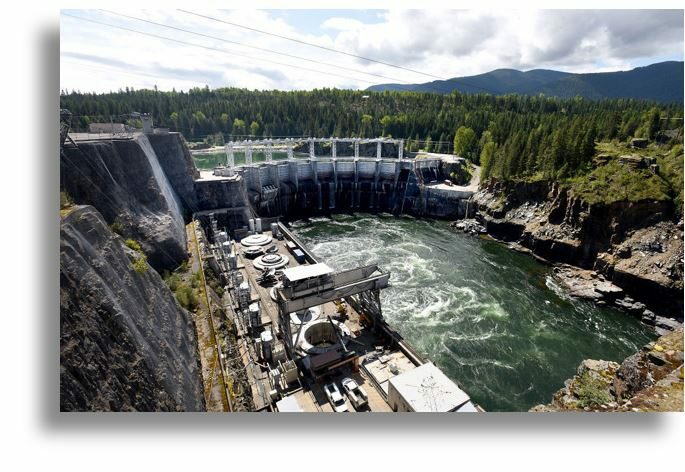 With over 140 existing hydro plants having a combined generating capacity of approximately 2,500 MW, Idaho has some of the greatest hydroelectric power resources in the country. Hydroelectric facilities supply the bulk of Idaho’s power, contributing significantly to the state’s low electric rates. Hydropower provides roughly half of the state’s electricity. Hydroelectricity is a uniquely-valuable renewable energy resource. It is clean and inexpensive; it is a dispatchable resource, and has greater flexibility than many other forms of renewable electric generation for matching the always-fluctuating demands on the electric grid as well as accommodating the highly-variable contribution of other renewable energy sources. 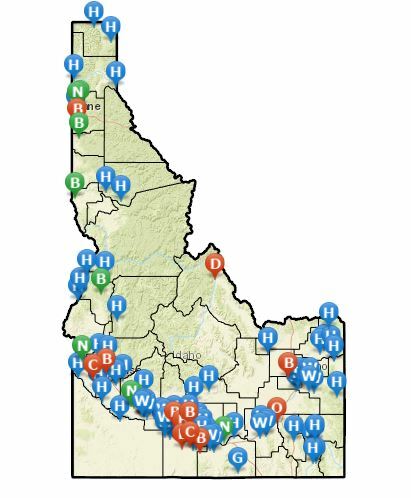 Idaho’s largest hydroelectric projects are the 1,167 MW Hells Canyon Complex (consisting of the Hells Canyon, Oxbow, and Brownlee dams) owned by Idaho Power Company, the 400 MW Dworshak dam operated by the U.S. Army Corps of Engineers, and the 260 MW Cabinet Gorge Project owned by Avista Corporation. In 2010 hydroelectric generation was 9,154,00 MWh, providing about 76% of in-state electrical generation. In order to generate electricity in a hydropower dam, water from the reservoir is released into a massive pipe called a penstock, where it enters the powerhouse deep within the dam. The force of this water pushing against the turbine blades causes them to rotate. 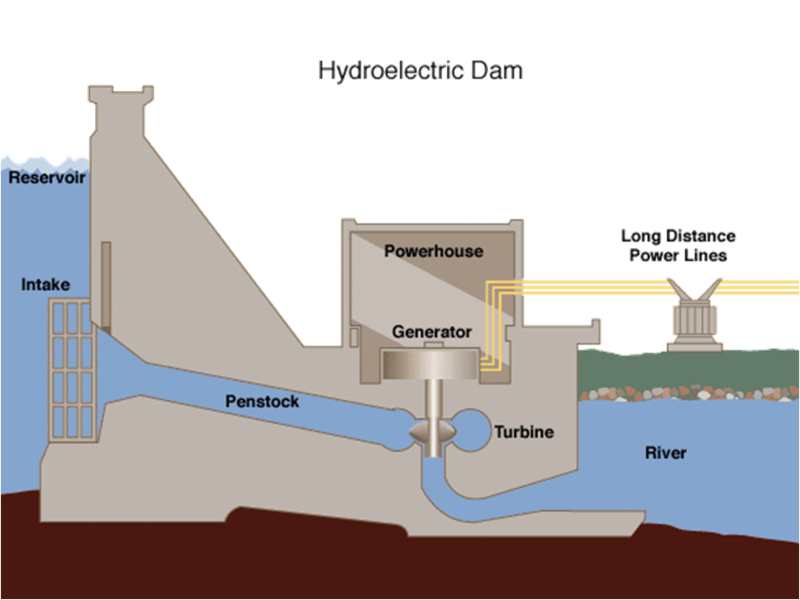 The turbine is connected to the generator that produces the electricity. All of the water entering the turbine returns to the river downstream in the tailrace of the dam. At times when more water is available in the river than can be used by the dam, the additional flow passes through the dam’s spill gates. Please click here to toggle additional features on the map. Data is compiled from the U.S. Energy Information Administration (EIA) and the Northwest Power & Conservation Council. Please contact our office at (208) 332-1660 for any questions or data requests. GIS Data Disclaimer — While the data has been tested for accuracy and are properly functioning, the Idaho Governor’s Office of Energy and Mineral Resources disclaims any responsibility for the accuracy or correctness of the data. THE FOREGOING WARRANTY IS EXCLUSIVE AND IN LIEU OF ALL OTHER WARRANTIES OR MERCHANTABILITY, FITNESS FOR PARTICULAR PURPOSE AND/OR ANY OTHER TYPE WHETHER EXPRESSED OR IMPLIED. In no event shall the Idaho Governor’s Office of Energy and Mineral Resources become liable to users of this data, or any other party, for any loss or damages, consequential or otherwise, including but not limited to time, money, or goodwill, arising from the use, operation or modification of the data. In using this data, users further agree to indemnify, defend, and hold harmless the Idaho Governor’s Office of Energy Resources for any and all liability of any nature arising out of or resulting from the lack of accuracy or correctness of the data, or the use of the data. Please acknowledge Idaho Governor’s Office of Energy and Mineral Resources as a source when Idaho Governor’s Office of Energy and Mineral Resources data is used in the preparation of reports, papers, publications, maps, and other products. To ensure that appropriate documentation and data limitations are provided, these databases should not be redistributed to any other parties.